Context: It is apparent that music plays a strong role in Lithuanian culture holistically with song and dance frequently included. Further, some of these wedding traditions seem to stem from historical context including submission to another nation. Such references can be found in the attire worn by and actions performed by those who prank the couple. For example, the hat serves as a symbol to indicate the resemblance to the other foreign group. Further, the woven fabric, another folk object, takes on the symbolic meaning of unity. Interpretation: Practical jokes are common in weddings throughout many cultures. Often, the individual at the expense of the joke is going through a rite of passage. In this case, marriage is the rite of passage, in which the couple is progressing to something greater. Further, the hats worn by the prankers may be an example of “blason populaire” as it draws from a stereotype. Context: Flower accessories are worn in various scenarios throughout Lithuania, as it is a component of the nation’s traditional outfit. Further, the accessory is worn both casually and formally. Sometimes, the Vainikai are made from real flowers while others are artificial. Also, the occasion determines who makes the Vainikai. Interpretation: Folk objects often take on symbolic meanings. Vainikai ties present-day Lithuanians to the past by referring to traditional garb and long time traditional practices. Interpretation: The informant does not explicitly state that a ghost was involved in the dog’s shift in behavior. However, her reference to some sort of unusual spirit alludes to a folk belief in the possession of a soul. Ghosts and spiritual legends usually fall into the folklore category: legends. This is an example of animal folklore and legend. Further, the story alludes to a folk belief in spirits or souls after life. 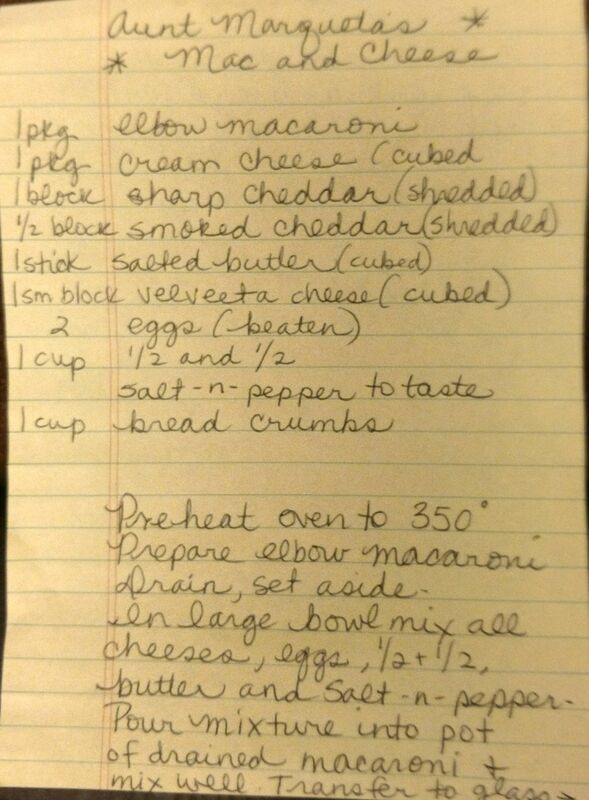 Context: This recipe was passed onto the informant from her husband’s aunt. The recipe outlines how to make the aunt’s traditional Thanksgiving mac’ n’ cheese.While this meal is not solely an African American tradition, it is commonly found in African American Thanksgiving meals. The informant is caucasian and was introduced to this recipe through marriage. As a result, this recipe ties her to black thanksgiving culture. Interpretation: Folklore can link individuals to completely different people, customs, beliefs, and more. This linkage has become increasingly apparent with the rise of the internet and easy access to people around the world. In this case, the recipe links the informant to a different culture within the United States. Context/Interpretation: While different colors take on different meanings and degrees of significance around the world, red is almost universally used in the development of womanhood. Marriage is a defining moment of adulthood, specifically womanhood, in many cultures. Therefore, the red in Indian weddings stays consistent with the red symbolism. SmarterTravel. “So THAT’S Why You Shouldn’t Wear A Green Hat In China.” The Huffington Post, TheHuffingtonPost.com, 26 Jan. 2017. According to the article, “Red is the most powerful of all colors in Indian culture and holds many important meanings.” In fact, red can convey fear, power, fertility, love, beauty, and more. More significantly, red is known to symbolize an Indian woman’s marriage through red henna, red sindoor, and her outfit. After a prior discussion about Indian weddings, the informant continued to describe the second day of the celebration. In the morning of the second day, the couple is physically painted with haldi by the families. Haldi is also known as turmeric which contains cleansing qualities and produces a glowing effect on the skin. Context/Interpretation: The couple’s cleansing is both literal and symbolic. According to the informant, it is important for the couple to be cleansed by their families prior to the unification. The yellow haldi represents blessings, purification, and it is supposed to ward of evil beings. During a discussion about Indian wedding customs, the informant described a common practical joke. There is a tradition in which the bride’s siblings steal the groom’s shoes. Consequently, the siblings set a price that the groom must pay in order to get his shoes back. Context: This tradition is considered a practical joke as it is implemented at the expense of the groom. Practical jokes are especially apparent in weddings because the ceremony is a rite of passage. Context/Interpretation: This cemetery background information adds to the narrative’s performance aspect. Also, the informant’ friend is vernacular authority because the story appears more credible when others can support the main claim. After asking about any unusual experiences, the informant recounted a peculiar situation that took place at USC. Context/Interpretation: The informant lives with one roommate in a residence hall style dorm at USC. While the performer did not explicitly state that he saw a “ghost,” he described the occurrence as being paranormal as in out of the ordinary. The belief in ghosts in America is so vast, yet it strays from religion and government. However, it is very common for informants to refer to these types of stories as unusual, rather than ghostly. I asked the informant to describe an unusual happenings regardings spirits or the soul. She answered with the following story. “A few weeks after my dad died, he came to me in a dream. This was the most realistic dream I have ever had even to this day. Of course I was so overjoyed to see him and talk to him because he had just passed away. He told me that he was so proud of me and his grandchildren and that I’ve done a wonderful job raising them. After we talked for awhile, he said, ‘I’m sorry honey but I have to go now.’ I cried and screamed, ‘Please Daddy don’t go! Don’t go!! !’ He said, ‘I love you, I’m okay, don’t be sad and don’t be scared. I’m okay.’ He started to rise up, up ,up in the air, and then he was gone. The next thing I know my husband is saying, ‘What’s wrong?’ I was sitting on the edge of the bed, looking up at the corner where the wall meets the ceiling, and yelling for my dad to stay. Context/Interpretation: This collection depicts folk belief in a soul and implies the existence of an afterlife or spirit. Further, this narrative reflects the life cycle as the informant’s father spoke to her after death, and he mentioned new life, her children.